And yes, this is my first application to go live on Google's PlayStore, so please bear with me, if there's any bugs before rating the application. I am gonna start out from explaining the usage, basic stuffs and the main modules comes with application package. The way we could use this application is broad, some of the basic usages are listed below. Come on, that's all we wanted, you could prank your friends or families by setting up a speaker connected to your computer with our receiver app in it. Now you're the king, speak through the app and prank the hell out of 'em. You may use it for wireless voice logging purposes, as the receiver app contains "Auto Save" feature. Lots of other use cases, you could just imagine. No need of remembering IP addresses, the app has a unique broadcast system, which is able to find all the receivers over the connected network. Transmits microphone data real-time to the connected receiver, without a single lag, and without stressing the network. Every application moments are notified as a notification on your status bar. And also even if you swipe your app off the recents list, it would uninterruptedly transmits the audio. You could control the volume of Mic, so that higher the boost value, longer the distant voice you could hear from. NOTE - Consider using it in a moderate value, if else it may cause higher distortions and noise on the receiving end. Just shake your device to start or stop the audio transmission. You could change from less sensitive to highly sensitive whilst listening for shake events. By enabling this on Settings screen, the real-time notification icon shown on the status bar would be hidden and it also hides the notification whilst the screen is locked. Sometimes the default port 8888 would be acquired by some other application in your system. So I've added an option to change the port number, as shown in your receiver application. For now, WSMA Receivers are available for most of the operating systems, which supports JRE (Java Runtime Environment). For now, there's no Android app which can be used as a receiver, but be assured, I'll make one soon. This is an essential feature, which could mute the real-time audio playing in. Automatically saves the received audio, between each specified interval from 1 minute to 1 hours. Techies could use this to determine packet level or feature level identification. As discussed in the sender part, you could customize the port number here, which then should be changed in the sender part, for the sender to identify the receiver over the network. You could download the .wav version and .mp3 version separately from the Downloads section. .wav files are raw audio files, you could use these file to analyse the audio data and do forensic operations later. But, the drawback is, it needs more hard drive space. As Java contains internal system to make wav files, the program space would decrease a lot. .mp3 files are usually compressed, which could be later transferred and used by ordinary users for just hearing the recorded audio. And it doesn't require much hard drive space. The only drawback is program size would increase, as Java doesn't support internal conversion of MP3, so had to use an external library for this purpose. When the Auto Save option is enabled, it would automatically saves the received audio after each end of the connection and app exits. Download the WSMA Sender app from PlayStore, link is listed in the Downloads section. Download the WSMA Receiver app for your specific OS from the Downloads section. Download JRE (Java Runtime Environment) v1.7 or above from the Downloads section. NOTE - You may ignore downloading this, if you've already installed it. Now open the WSMA Receiver app, if you're a Windows user, I've already made a executable, all you wanna do is, just double click. A) Open your Terminal application, it depends upon the OS you're using. B) Now use the "cd" command to navigate to the folder, in which the receiver .jar file resides. D) This is the last command to execute, which would run the application. NOTE - The filename may change according to different versions, so please make sure to enter the correct file name. Now, connect your devices over any network you choose, you may turn on the hotspot on your mobile and connect the PC to it or vice-versa. Install the WSMA Sender app in your Android device, then click open it from the Launcher. You don't have to do much on the welcome screen, you may enable or disable some features, and make sure to enter the control port as shown in the WSMA Receiver app, then click on "Let's get started" button. Now, you could see a Search screen, which would lists all the active WSMA Receivers over the network. Hurray! That's it, now you could have fun with the application, feel free to tinker with it. Fixed a bug which caused the application to crash when the auto save timing was changed. Fixed some connection lag issues. Fixed a bug which caused the connection to disrupt in the middle. I just need to record with it ... can I ? I was wondering if i can use it with Adobe Audition? Can u help me? Hey, can I use this for gaming? How to disable the audio? I don't wanna listen to myself speaking.. This app won't emulate microphone for your PC. It acts as a wireless microphone which it transfers the live audio to PC, finally to the speakers connected to it. Is it possible to connect more than one microphone/smartphone? Simultaneous microphone connections are not implemented for now. But it will be added as a new feature in the future.  Is there some way to use it on Skype or games like CS:GO? I would like to connect 8 microphones and mix them. Can I do that? Will soon add a manual IP entry option. Where´s the link to the Receiver? Just at the end of the post, download what variant you want. Would appreciate a (paid?) option to eliminate/mute ads. Good luck with the AndroidToAndroid version. I have the sender and receiver but still didnt work, what can I do? Feel free to do so. But link to this post instead of providing direct download link. I want to use this as mic in in a software "guitar rig" . As this doesnt' show as any mic in device i can't select from the interface. any suggetions ? Hi therem can it be used as Skype microphone ? Nope it's not possible, unless you have stereo mix. Both the transmitter (Android app) and receiver (Windows app) work great! I have one problem with the Windows app: I changed the time length setting and closed the app. Now the app never launches again. I've tried this on multiple computers/laptops. Thanks for reporting the bug. 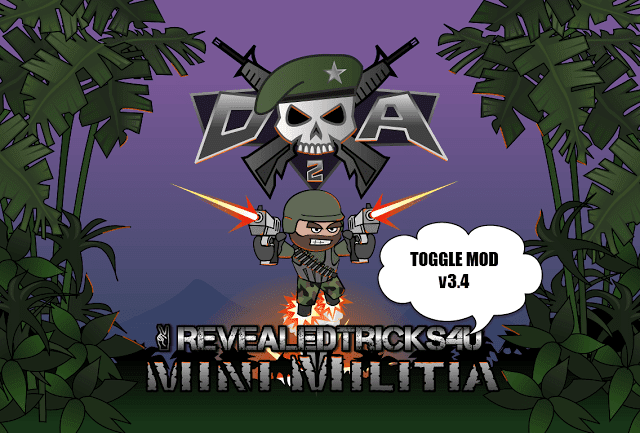 I've just released a bug fixed version, please download the latest one from above or just wsma.revealedtricks4u.com. can i use for screen recording ??? Wireless Mic Advanced works great! 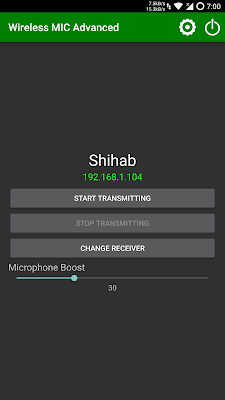 Your Wireless Mic Advanced Android app and Windows app work great! I can not connect, tried to change the port, but it did not work, I also changed the port name on my computer, and even then I still can not connect, even the two devices connected to the same wifi network, please help me. Windows application is not working anymore. Till yesterday it was okay. When opened, nothing shows. In task manager it opens and closes after a second. I'll soon add a manual IP entry option, so that you could directly enter the IP address instead of letting the app automatically find it. And yes, the auto search would hang up when mobile data is on, I am working on a fix. no .... you don't need use internet connection to use this great shihab apps. just enable hotspot in android, then connect from laptop or other OS with wifi. i was try in my case and this apps working properly. This app works really nice. Also your toggle mods are great! I want to request something. Can you make Toggle Mod for Pokemon GO Android 5 no root? Any feature like joystick will be also helpful. 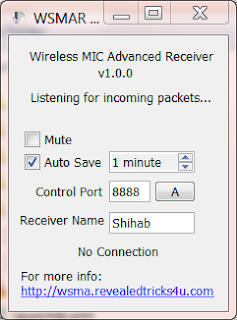 I have connected it with WSMA receiver on my pc. It shows that its transmitting but the sound doesn't comes from my laptop. Can you plese know me what I doing wrong. Please check the receiver, if it shows Receiving Audio Packets and make sure the system and app volume bar is not muted. 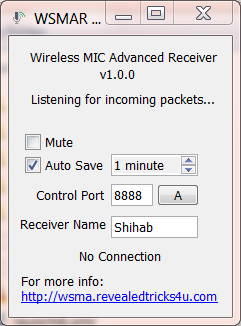 I have connected with the WSMA reciver on my pc. It is showing that sound is transmitting but the sound doesn't comes from my laptop. Can you please tell me what I would be doing wrong. Could you try resetting it up and give it a hit? Wooooww .... thank you bro, your apps work properly. its very helpful. but how to decrease echo sound to audio output? Glad that you liked it! You could decrease the echo by decreasing the volume in your Android or in the server side. 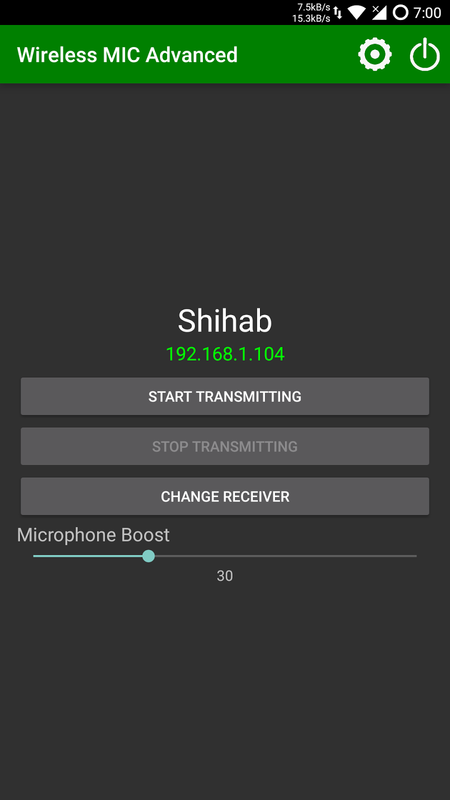 Try decreasing the mic boost slider in your Android or by lowering the volume server side. Please add a feature that can change the output's file name! I'll surely consider your suggestion for the next update. Hey I absolutely love this app! It's really helpful when doing projects like videos. But it'll be nice to have an option where you can save by yourself the audio recorded on the receiver, aside from the auto-save. Also, I don't know if it's possible, to control the transmitter from the PC. First of all glad that this app turned out to be useful for you. I'll think of adding a manual save button in that case. Ya controlling the transmitter app from server side is limited. But, hey that'd be great, i'll think of it. This app unfortunately doesn't work. As a programmer, I suggest you use IPs rather than ports, ports are not noob-friendly, and some routers just don't allow open ports (like mine). I bet you've stopped developing this app. Anyway, just noting it doesn't work here.